Precisely identifying linear epitopes of important therapeutic and diagnostic antibodies with all overlapping linear peptides was invented at Pepscan more than 20 years ago. Pepscan has since then perfected this technology and broadened its applications, delivering unparalleled sensitivity and reproducibility for epitope mapping all types of samples. A linear epitope can be defined as a short contiguous sequence of amino acids, which fully satisfies the paratope requirement. As easy as it seems, such epitopes can be identified by using overlapping linear peptides derived from the target sequence. However, not all methods are equally successful. Coating of linear peptides onto surfaces often is not effective and depends on the sequence composition. In turn, this results in an unexpected or erratic behavior of test samples, when antibody does not bind the correct epitope motif or no binding is detected. To overcome these problems Pepscan developed the HiSense epitope mapping platform, using a solid support with a proprietary hydrogel matrix into which peptide sequences are directly synthesized using robust Fmoc peptide synthesis in a high density. This results in unrivaled sensitivity of the arrays and allows to reliably detect even the weakest binding signals. These immobilized peptide arrays are re-usuable and can be tested multiple times. This therefore allows for screening of series of antibodies or sera on a single array, making HiSense linear epitope mapping a fast and cost-effective option for drug discovery. To assist patent protection of new therapeutic antibodies additional information about their novel structural and/or biological properties is of great use. In-depth information on specific and unique target site (=epitope) for novel antibodies is often required. HiSense and fine epitope mapping can provide comprehensive descriptions of the epitope at unrivaled resolution. In the present case one example on a monoclonal antibody directed against human anti-CD3ɛ is shown. One monoclonal antibody directed against human and cynomolgus CD3ɛ was analyzed using a full library of overlapping 15-mer linear peptides designed based on the homologouos sequences of human and monkey CD3ɛ. Recorded intensity profiles clearly show that the antibody binds both CD3ɛ sequences at the very N-terminus. This region is also highly flexible as based on X-ray b-factors (1xiw.pdb). Pepscan HiSense epitope mapping provides depth-in view onto linear sequence motifs required for an antibody to bind its target. 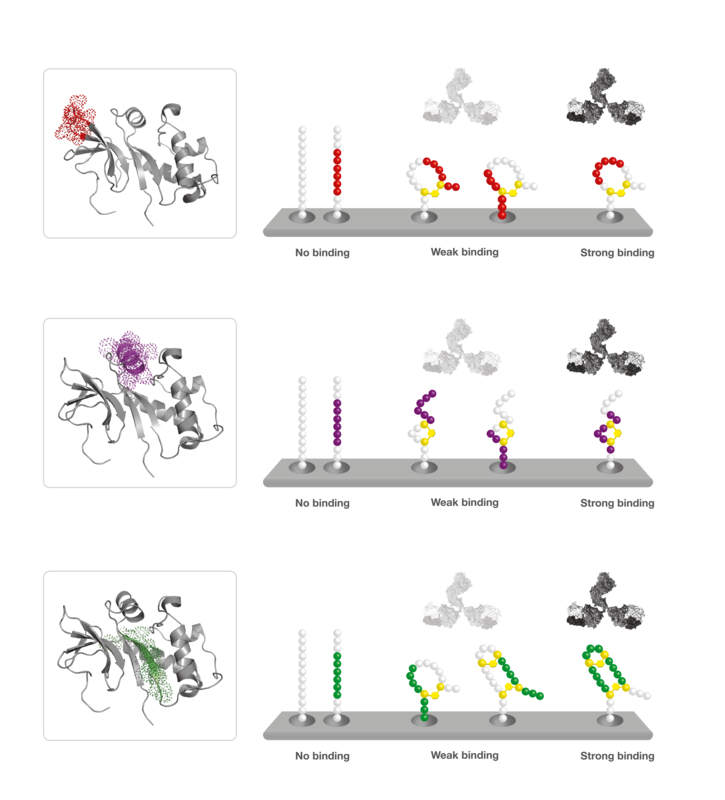 Additionally, crossbinding to homologous sequences can be assessed for a single antibody or a panel of antibodies due to a unique re-usability of the arrays. Case example of results obtained with High Sense Linear epitope mapping of a monoclonalantibody performed using a peptide library derived from human and monkey sequences of CD3ɛ. Obtained intensity profiles are shown as a “butterfly plot” on the left panel. 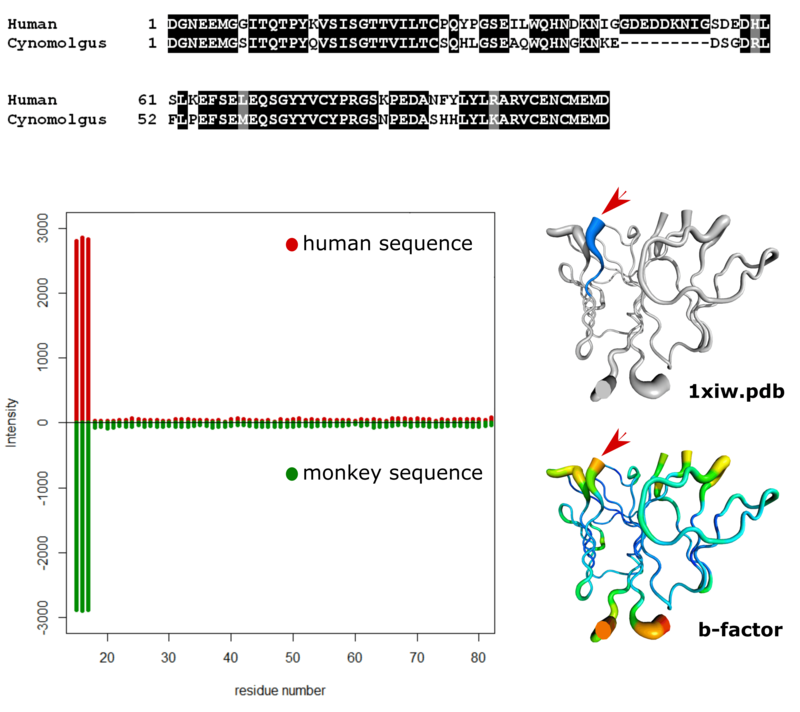 Sequence alignment of human and monkey sequences is shown above. On the right panel are two 3D visualizations of the epitope mapping results designed using 1xiw.pdb. On the top right panel is the CD3ɛ with the target epitope shown in blue and with red arrowhead and color ramped distribution of the crystallographic b factor of 1xiw.pdb is on the right bottom panel.